One of the things I love the most about the Internet Age is being able to explore the blogs and social networking sites in search of the fascinating, sometimes brilliant and sometimes inane journeys each of our mind’s take us upon. I love to read it, but if it is what used to be called, “a touchy subject” I would read, then maybe pin to Pinterest or share on Facebook, but I would almost without exception not comment on my personal stance about the matter in hand. I believe everyone has a right to their own beliefs as long as they are not hurting other people mentally or physically. I like privacy. I don’t like that Big Brother is tracking our snail mail (as reported in the Seattle Times Nov 2, 2014), reading our private emails and storing our online chats, texts, comments and blogs. I want to maintain my anonymity so as not to negatively impact the people I care about and yet I also feel a great need to be brave and open up about my own unique thoughts and feelings. I want to feel safe being my authentic and genuine self. I want to live my life as the person I truly am with all of my nuances good and bad viewed, accepted and appreciated by the outside world. Am I not a hypocrite in believing that each of us are allowed our own beliefs and should be allowed to express them without ridicule when I do not allow myself to be susceptible to criticism or, even worse, trolling? Why do I have one rule I expect the world to abide by and yet willingly anticipate that the world will fail to tolerate me? Do I suffer from a Holier-Than-Thou attitude? And here I am, starting my own blog?! And, my new friends, I hasten to warn you, I understand that a blog is longer than a tweet and yet it should be shorter than an essay. And I will admit it, I am more of an essayist than anything else. I am long-winded and my fingers like to keep typing what my mind is thinking. Thank goodness our fingers do not secrete glue or I’d be writing 24/7, 365 days a year! But this post wasn’t supposed to be about questioning myself and asking you to say I am okay or acceptable or whatever. I was simply expressing my fear and hesitation — or is it bravery — in making this controversial topic my post for the day. 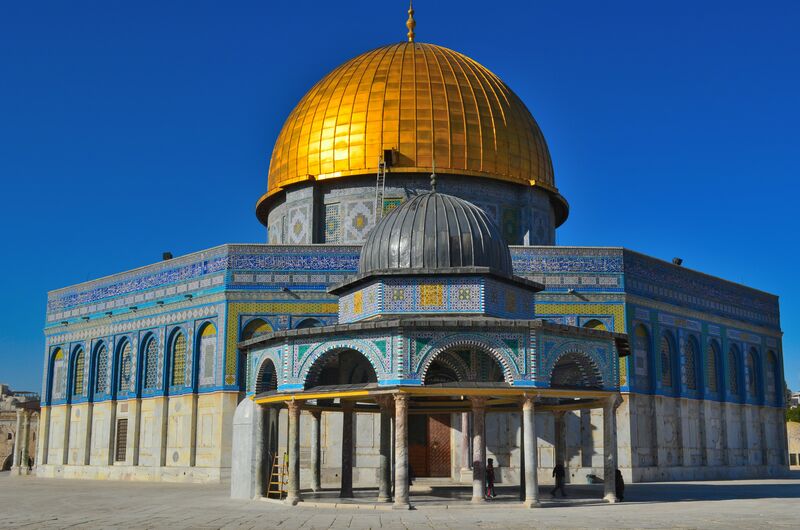 Today I am thinking about the Muslim-Jewish conflict over the Temple Mount. And so, having already hijacked my own posting I will keep my thoughts and questions short, and hopefully succinct. First, if the Temple Mount is the #1 most sacred site of Judaism and once the site of two important ancient temples, why does the Torah forbid its people to pray at that location? And secondly, (this is the stupid question), if the Rabbis frown upon praying at the location and Jewish law forbids it, why fight so hard for it? Is it just for the principle of the matter? I understand from the Bible that very important events have happened there and I understand that the Quran also holds evidence of very important historical events, sometimes at the exact location, making it the 3rd most holy place for the Muslim world. And I wonder, why can’t both religions celebrate their one true god in their traditional manner as suggested by Yehuda Glick in the documentary film, End Times Eyewitness? Is the answer as simple as Glick suggests when he says that it is “even possible that the existing Dome of the Rock Muslim shrine could be incorporated into the rebuilt temple, but there’s only one ingredient missing: an Islamic faith that would be tolerant to Christians and Jews”? Why can’t we all just get along? That’s what I’ll be praying for: Peace, Love & Friendship among all of Earth’s peoples. I did not feel in any way like I was being lectured from a specific viewpoint, that the arguments (for lack of a better word) for one side and the other were equally presented and left for me to come to my own conclusions about. I am not Muslim. I am not Jewish. I do not have a college education but I am smart, and oftentimes want to make my own mind up about how I feel about things. Throughout the writing of this blog my opinions may adapt or change regarding any topic matter because I am a person learning new things about life and the world every single day… I am a work in progress as are, I would hope, each of you.